80% kitchen. 20% gym. 110% correct. With October’s Split, I decided to jump on the 1st Phorm bandwagon and give a fair shake at the 30-Day Challenge. If you haven’t heard of this company and what they promote, I highly recommend doing so because it’s 100% free, incredibly informative and overall, I saw a lot of results I was elated with. One week of the month, I spent weighing each bit of food, measuring how much I was putting into my body and planned ahead for a week of success. I crushed it at the gym, felt great and my body seemed to be working much more effectively with all the added nutrients I was getting from the upped dosage of veggies and less processed foods! And then, the next week I ate breakfast pizza 4 out of the 5 workdays… I like to call it ‘balance’. 🤷🏼‍♀️ Shock the body, keep it on its toes. The results I saw from the workouts themselves were making me regain that admiration for those baby muscles I was growing earlier in the year. I might not have been lifting heavy, but I was lifting again and felt fantastic. You can see my triceps without flexing now and I want to break that stigma of ‘manly’ arms and love my progress. I want to be proud of the muscle growth and be proud to show off the work I’ve put into them. Overall, I was really happy with my results from this 30-Day Challenge! At first, I didn’t want to buy into the hype of 1st Phorm, but now I’m a converted believer. It’s a program I can see myself being successful with, want to educate myself in and share just how helpful it can be. So much in fact, I decided to keep it going and join the Fall Sprint Challenge! This is an 8-week course that I’ll be following until the week before Christmas. The workouts are just a smidge off from what I was already doing, but they will be challenging other muscles/body parts I’ve been neglecting. The goal is to fully follow the plan as it’s mapped out. No cheating! Every workout. Every meal. Every thing accounted for. (Well, until Thanksgiving, but that’s an animal in itself). 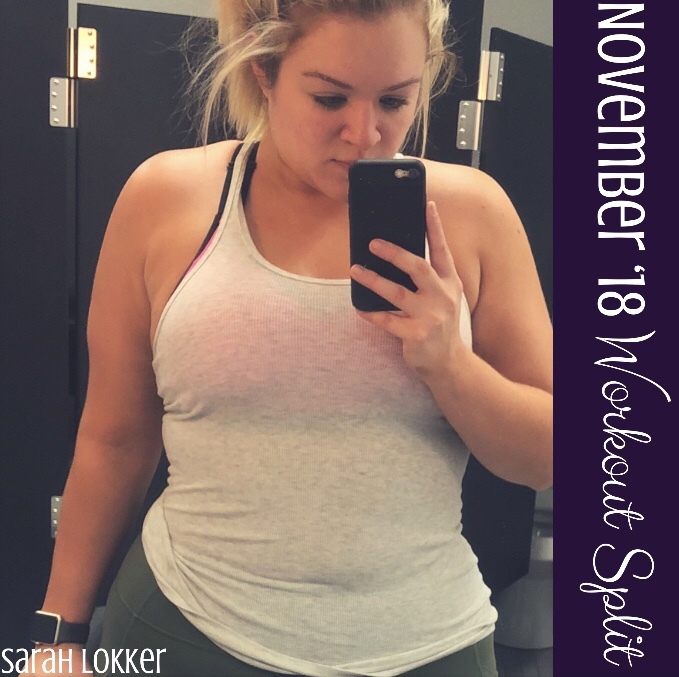 This entry was posted in fitness and tagged #blogger, 1st phorm, bbloggers, be healthy, beast mode, beauty blog, blog chat, blogger girl, blogger life, blogger lovin, blogger style, bloggers, blogging, blogging gals, blogging tips, diet, fashion blog, fbloggers, fit chick, fit chicks, fit fam, fit foodie, fit girls, fit life, fitness journey, gainz, get strong, girls that lift, gym addict, gym life, gym rat, gym time, health, health and fitness, healthy, healthy lifestyle, healthy living, i am 1st phorm, inspiration, life with sarah, lifestyle, lifestyle blog, live fully, making it happen, motivated, muscle growth, never give up, on the blog, phamily, progress, sarah lokker, sarahhlokk, savvy blogging, squat, strength, the dedicated, train hard, train harder than me, transphormation, weight loss, weight loss journey, you can do it. Bookmark the permalink.